Had a very interesting conversation with rho which started at the end of our after-dinner walk. As we slowly neared home, savouring the quiet warm air, enjoying the Moon and Venus in a pretty sky, the Moon down and right, just a couple of degrees apart, checking the separation with our hands, wondering where Mercury was, I think I said that the Moon was "drawing closer" to Venus. And that it was going to "zip past" Venus and be beyond it by a few degrees tomorrow. She immediately disagreed. She looked at me like I was from Mars. "The Moon isn't going toward Venus; Venus is going toward the Moon." And they were going down, west. Like the Sun! Part of it was terminology. Was it an orientation issue? I wasn't explaining some of the concepts clearly. I felt that part of it was the complexity of the multiple vectors or sets of motion. We talked briefly about occultations before heading indoors. Later, winding down for the night, we enjoyed Ian's photo (on Facebook) of Venus "in the cradle" of the Moon, Earthshine showing, we reopened the topic of celestial motion. I launched SkyTools to get some data. In the Interactive Atlas, zoomed in on the scene, I showed how moment by moment, the Moon could be seen moving eastward, toward Venus, very quickly. I had mentioned this outside that through a telescope, tight on the Moon, one would see stars disappearing on the east edge of the Moon. All the while, Venus was moving too, surprisingly fast actually, against the background stars. I included the horizon line in the chart to show how the planets, including Mercury, and the Moon, were setting, falling into the western horizon. That was the major or significant observed motion over the course of minutes and hours of time. Then I showed the scene the following night where the Moon was now a thicker crescent and left of Venus. I showed that the Moon had "hopped" over the planet. Day by day records would show the Moon travelling east. I think I hurt her brain. She thought everything moved east to west. I explained that was true for all deep sky objects and the stars. Yes. And, again, I tried to distinguish between the Earth's rotation. The diurnal motion. The 24-hour rotation of our planet. Under the sky. I emphasised that everything was rotating counter clockwise. All the planets were moving counter clockwise. And that, in general, all the prime solar system objects, including all the moons around the planets, did the same thing. What?! Something clicked. I could see her brain rewiring. "I never thought of it that way." We talked a bit about spin and conservation of momentum in early solar system formation. We talked a bit about exoplanet systems and their motions. We talked about why up is up and north is north. We talked a bit about orbits and that in general they were all elliptical. Nothing was a perfect circle. She wanted circles. Nope. Ellipses are common. 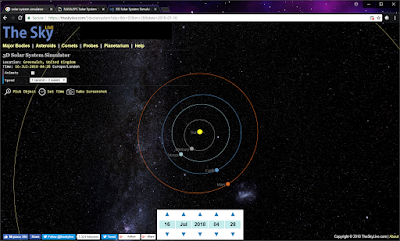 We talked a bit about solar system orbit migration. We talked a bit about orbital speeds. I misinterpreted a question initially but clarified that the orbital speeds were in fact different: faster for the inner; slower for the outer. I played with the date/time settings is TSL. We talked a bit about now being an awesome time to look at Mars from the Earth, given their proximity and given Mars's offset orbital path. While in the tool, moving freely in space, I zoomed out. It was clear the Pluto is very different than all the other official planets, looping inside Neptune for a time, very elliptical, and highly inclined. I still wanted to show a simulation of the Moon spinning around the rapidly spinning Earth all while the planets drifted slowly around the Sun. I mentally noted to look for a tool.